Richard M. Bennett is a military & security analyst and senior associate with AFI Research & Armed Forces Intelligence and a member of the Royal United Services Institute for Defence Studies. He previously worked with SIPRI on arms trade registers and with the IISS on its annual Military Balance publication from 1967 to 1991. His latest book, Fighting Forces, a review of 26 of the world's leading armies, will be published by Barrons in September. His next book, a history of the world's Intelligence services, will be published next year. 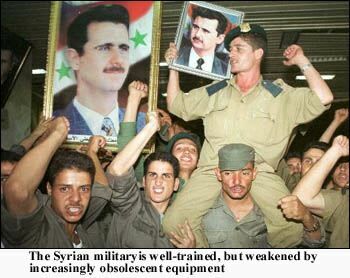 The Syrian military remains one of the largest and best-trained forces in the Arab World. Despite losing every major conflict since 1948, it has distinguished itself as a highly disciplined and motivated force that has gained the respect of the Israeli military. In particular, the Syrian army is known to have developed the skills necessary to breach the type of defense in depth found on the Golan Heights, obviously a potent factor in any future conflict with Israel. However, its combat strength has deteriorated dramatically during the last decade as its equipment has become increasingly obsolescent and poorly maintained. The collapse of the Soviet Union, which created immense problems of re-supply, equipment and spare parts for the Syrians, and the slow down experienced by the Syrian economy resulted in a considerable downgrading of the military's combat efficiency. This was most evident, perhaps, in the fall of 1998 amid rising tensions between Turkey and Syria over the Assad regime's support for Kurdish PKK guerrillas, when it became quite clear that Syria was incapable of mounting a serious deployment of forces on the Turkish border. A second weakness that pervades all branches of the Syrian military was largely inherited from Soviet military advisers over the years - the unwillingness of staff officers or field commanders to show initiative or react independently to a crisis without observing the usual chain of command, slowing down the military's ability to respond to either an enemy move or to take advantage of occasional openings for offensive action. This was painfully evident during Syria's clash with Israeli forces in Lebanon during the early 1980's, when Syrian commanders confined the operations of the forces under their command to a pre-determined course of action, irrespective of the circumstances that prevailed on the battlefield, and exhibited little combat initiative. Since July 1998, however, when the late President Hafez Assad replaced Chief of staff Gen. Hikmat Shihabi with Gen. Ali Aslan, this has begun to change. While Aslan is still a product of the rigid Soviet school, he has exhibited a more modern style of command, willing to accept, if not actually encourage, independent action and the delegation of command. Courses at the Staff College in Homs have become more realistic, with an acceptance of past mistakes and a willingness to learn from them. Israeli military thought (particularly with regard to armored and combined unit operations) is now closely studied, not just for the purpose of developing countermeasures, but also to emulate the enemy as far as possible. With a (non-reserve) strength of some 215,000 personnel, the core of the Syrian Army is headquartered in the capital and the majority of other combat units are deployed along an arc from northwest to southwest, facing the Golan Heights and Lebanon. The Army Command in Damascus directly controls the Republican Guard Mechanized Division (an armored division in all but name), which is equipped with around 350 T-62/72 main battle tanks, 350 BMP-2/3 armored infantry fighting vehicles and BTR-60/70 armored personnel carriers. In addition, there are 50 BRDM-2 armored reconnaissance vehicles, 30 122mm 2S1 and 20 152mm 2S3 self-propelled artillery, 50 23mm ZSU-23-4 self-propelled air defense and 30 122mm BM-21 multiple rocket launchers. This unit always receives the latest and best equipment, such as the T-72M main battle tanks, BMP-3 armored infantry fighting vehicles and will be the first to be re-equipped with new self-propelled guns. Additionally the Army Command has direct control of several independent motorized infantry brigades, including the 'Desert Guard' and the elite 120th Mountain Infantry Brigade. The heavily fortified defense zone between Damascus and the Golan Heights has grown to include two independent artillery brigades and two independent anti-tank brigades with up to 1,200 T-54/55 tanks in hull-down static defense positions. There are some 100 122mm M-31/37 and 50 152mm M-37 field guns in static defensive positions and up to 300 85mm M-44 and 100mm T-12 anti-tank guns, protected by large scale minefields and supported by massed anti-aircraft guns. The Syrian Army's main war-fighting element comprises three corps formed in 1985 to give the Army more flexibility and to improve combat efficiency by decentralizing the command structure, absorbing at least some of the lessons learned during the Israeli invasion of the Lebanon in 1982. The 1st Corps also has four independent special forces regiments, including two trained for heliborne commando operations against the Israeli SIGINT & Observation posts on Mount Hermon and elsewhere in the Golan Heights. The 10th Mechanized Division, headquartered in Shtoura, Lebanon. Its main units are deployed to control the strategic Beirut-Damascus highway with the 123rd Mechanized Brigade near Yanta, the 51st Armored Brigade near Zahle in the Beqaa Valley and the 85th Armored Brigade, deployed around the complex of positions at Dahr al-Baidar. Other major combat units known to be regularly deployed to eastern Lebanon are the 27th and 82nd Brigades from the 3rd Armored Division and the 87th Brigade from the 11th Armored Division, usually to the bases around Baalbek, Rayak airfield, Jub Jenin, and Rashaye. There are five special forces regiments in the Lebanon, including the 5th SF, which is deployed in the central mountains protecting the numerous SIGINT, observation and radar bases. It is believed that the Special Forces in Lebanon also include a small number of covert units trained to penetrate deep behind the Israeli positions on the Golan Heights to disrupt the movement of reserve units moving up to the frontline and to assault the positions on Mount Hermon in concert with a heliborne commando attack. The 2nd Reserve Armored Division, with the 14th and 15th Armored Brigades and the 19th Mechanized Brigade. The 2nd is also believed to operate as the main armored forces training unit. Other units under the control of this corps include four independent infantry brigades, one border guard brigade, one independent armored regiment, effectively a brigade group, and one special forces regiment. The Coastal Defense Brigade, which operates largely as an independent unit within the 3rd corps area, is headquartered in the naval base of Latakia with four Coastal Defense Battalions in Latakia, Banias, Hamidieh and Tartous. Each Battalion has four batteries of both the short range SSC-3 Styx and long range SSC-1B Sepal missile systems. Syrian Reserves amount to some 300,000 soldiers, forming units which include the 2nd Armored Division in Aleppo, while the 12th and 13th Motorized Divisions would be formed from the best of the two armored brigades, two independent armored regiments, 30 infantry brigades and three artillery brigades. While the standard of training is reasonable, equipment is of very poor quality and limited in number. Syrian armored divisions are structured along traditional Soviet Army lines, with the Armored Brigades each with three Tank Battalions and equipped with 300 T-62 M/K and T-72 main battle tanks and 50 BRDM-2 Recon.Vehicles. The Mechanized Infantry brigades each have some 300 BMP-1/2/3 armored infantry fighting vehicles and BTR-50/60/70 armored personnel carriers. The mechanized divisions are also Soviet style units, similar in most respects to the armored divisions, except in the ratio of infantry to armor. Each has around 200 T-55/62/72 main battle tanks, 250 BMP armored infantry fighting vehicles and BTR151/60 armored personnel carriers, 50 BRDM armored reconnaissance, 30 122mm 2S1 self-propelled artillery, 30 23mm ZSU-23-4 self-propelled air defense and 20 122mm BM-21 multiple rocket launchers, while the artillery has more towed guns, 122mm D-30 and 130mm M-46. The field artillery regiments each have 30 122mm 2S1 self-propelled artillery, while the air defense regiments attached to the armored divisions provide considerable cover with 30 ZSU-23-4 self-propelled guns and Batteries of SA-9 and SA-13 mobile surface-to-air missiles. The infantry units within all twelve front-line divisions have an effective anti-tank capability, with large numbers of AT-3, AT-4, AT-5, AT-7, AT-10 and AT-14 guided weapon systems. Syria has developed a considerable special forces (SF) capability since the creation of its very first such unit in 1958 in the form of the 1st Parachute Battalion. In the opening stages of the 1973 war, a daring helicopter borne raid by the Syrian 82nd para-commando battalion successfully captured the Israeli observation site on Mount Hermon overlooking the approaches to the Golan Heights. The Syrians are determined to make considerable use of Special Forces and indeed, this is one of the areas that has seen the new strategic alliance between Syria and Iraq begin to take shape, with both nations beginning to share both training and intelligence. The SF Command in Damascus has overall control of the elite 14th Special Forces Division, with the 1st, 2nd 3rd and 4th SF Regiments deployed on the Golan Heights, around the Mount Hermon area and in Lebanon. There are an additional ten independent SF Regiments (actually enlarged battalions), numbered 5th to 11th, deployed in Aleppo, near the Turkish border, and in Lebanon. Syria's counter-terrorist capability is provided by one of the SF regiments believed to be known as Al-Sa'iqa (not to be confused with Palestinian units of the same name). This unit is trained in a whole range of special operations techniques, combat shooting, hostage rescue, anti-hijacking, intelligence gathering, clandestine operations and long range reconnaissance and patrol. In addition, Al-Sa'iqa has trained in recent years with the Spetsnaz in Russia and is also believed to have a small number of ex-East Germans and non-Israeli Jews attached to its operations section. It is known to have operated with some success on intelligence gathering missions in Lebanon, Jordan, the West Bank and, on a very few occasions, within Israel itself, usually posing as Druze or Circassian residents. It has the pick of standard issue arms from the Syrian Army, but also has access to foreign weapons acquired on the black market - it is not unusual to see American 5.56mm M16A1 automatic rifles, Israeli 9mm UZI, Italian 9mm Beretta BM12 and German MP5K silenced sub-machine guns being used for clandestine operations. Syrian involvement in the Gulf War during 1991 provided an excellent opportunity to learn the lessons of a modern battlefield and highlighted the need to find an antidote to the use of air power. It was about this time that the decision to combat the threat posed by the Israeli Air Force (IAF) through the use of a massive missile assault was taken. It was accepted that it was highly unlikely that the Syrian Air Force (SAF) would ever, by itself, be able to seriously challenge Israeli air supremacy in the near future. While the Syrian military is still struggling to come to terms with its many disadvantages, including chronic lack of funding and technological backwardness, it has succeeded in finding a possible method of counter-balancing Israel's air power. The Syrians believe that a massive and sustained missile assault against Israeli Air Fields will go some way to nullifying Israel's air supremacy, both by the destruction of aircraft and airfield infrastructure and by the widespread use of runway denial weapons. In addition, Syria has long felt intimidated by Israel's nuclear capability and sees its combined missile and WMD arsenal as the only possible and effective counterbalance, if circumstances were to deteriorate sharply during a major conflict. The Syrian Missile Command is based in Aleppo and is known to control three mobile surface-to-surface missile brigades, each of which includes one battalion of FROG-7 SSM, one battalion of SS-21 Scarab SRBM and one battalion of SS-1 Scud-B missiles. Two of the three Scud Battalions moved south towards Damascus in July 2001, following at least one test launch of an improved Scud that landed close to Israel's northern border. The capability provided by some 60 TEL (Transporter-Elevator-Launcher) vehicles with 190 SS-1 Scud-B missiles (range 300 km, payload 985 kg) has been significantly strengthened by the recent construction of hardened silos and a deep network of tunnels. At least fifteen such underground workings, built with North Korean and Chinese assistance, are being readied for some 1,000 Scud-C missiles (range 500 km, payload 500 kg) and an additional four tunnels have been built to house the longer range Scud-D missiles (range 700 km, payload 500 kg), which the Syrians have recently begun constructing with North Korean, Chinese and Iranian help. This very large force of Scud-C/D missiles does not form part of the Corps structure or the missile brigades, they instead create a massive conventional first strike capability against the defenses on the Golan and Israel's main combat air bases. The tunnels will provide a considerable degree of defense against conventional bombing for both the missile storage and maintenance facilities and are linked to a large number of camouflaged launch facilities. The Syrians also have about 90 antiquated Russian-built Frog-7 missiles (range 70 km, payload 450 kg) and 210 of the more capable SS-21 Scarab missiles (range 120 km, payload 480 kg). Syria has two large underground missile production facilities near Aleppo and Hamah; both were built with Iranian, North Korean and Chinese assistance, while Iran and Syria jointly produce SCUD-C/D, CBW agents and cooperate on other strategic programs. Syria is believed to be attempting to acquire Chinese MRBM technology in the form of the M-9 and may indeed have already acquired M-11 missile systems. Most of the warheads fitted to these missiles contain conventional explosives for use against Israeli defensive positions in the Golan and to interdict reinforcements, or cluster bombs, designed for airfield denial. A number of the longer range Scuds are believed to be targeted on Israel's nuclear facility at Dimona and its Jericho ballistic missile launch sites at Sdot Micha Air Force Base. While around 150 warheads have been modified for Weapons of Mass Destruction (WMD), these would only be used under the most extreme of circumstances. The launch of these missiles would probably be accompanied by that of several hundred modified SA-2 and SA-5, redundant air defense missiles, to act as decoys. Such an attack, with a massive number of incoming missiles, would be designed to swamp Israel's early warning and targeting tracking radar systems, preventing its anti-missile defenses from successfully intercepting the Scud-C/D missiles armed with deadly chemical or biological warheads. Syria's stock of chemical and biological weapons also includes several thousand 122mm, 130mm and 152mm artillery shells and hundreds of bombs. There is considerable evidence that Sarin nerve agents and HD(mustard gas) are produced at facilities just north of Damascus and near Hama, while the deadly VX nerve agents are produced at a petrochemical complex just south of Homs. The main biological weapons (BW) agent facility is at the Damascus-based Scientific Research Council), where Anthrax, Cholera and Botulism developed by the Biological Research Facility are produced. Syria's chemical and biological weapons program, unlike its centralized Iraqi and Iranian counterparts, is dispersed around a number of small dedicated facilities and is proving much harder to detect. Syria can also can access the production capability of over a dozen government-controlled pharmaceutical plants spread widely across the country. On paper, the Syrian Air Force (SAF) is still a highly impressive force, with some 40,000 personnel, 90,000 reserves, and hundreds of combat planes. But with a growing percentage of aged equipment, lack of spare parts, a limited amount of annual flying hours and with little or no advanced training, its actual combat effectiveness is strictly limited. While there is little doubt about the bravery of individual pilots (even taking off during the disasterous air war with Israel in 1982 took considerable courage), the fact is that on every occasion there has been serious air combat between the two nations, the SAF has been mauled by the IAF. The SAF Command has, therefore, been forced to accept that this situation is unlikely to change in the near future and, as mentioned above, seek alternative solutions. The current combat strength, approximately 50% of which is fully operational, comprises some 90 Su-22, 20 Su-24, 170 MiG-21, 134 MiG-23, 40 MiG-25, 60 MiG-29 and 48 Mi-24/25 air craft, equipped with AT-2, AS-7, AS-12 & HOT Air-to-Surface and AA-2, AA-6, AA-7, AA-8 & AA-10 Air-to-Air Missiles. Many Syrian airfields are well protected against air attack with hardened shelters, camouflaged dispersal sites and heavy air defense. The air defense of Syria and its occupation force in Lebanon is provided by an independent command with some twenty-five air defense brigades, each with six surface-to-air missile (SAM) batteries. With some 55,000 personnel, it presently fields around 650 SA-2, SA-3 and SA-5 static launchers, 200 SA-6 mobile triple launchers and some 4,000 anti-aircraft guns ranging from 23mm to 100mm in caliber. In addition, there are two independent SAM Regiments, each with four batteries of 48 SA-8 and SA-10 mobile SAMs. Its early warning system comprises some several dozen mobile and static early warning radar sites scattered around both Syria and Lebanon. Although Syria has obtained useful technical information resulting from the Serbian and Iraqi experience of Western air strikes and has hardened much of its command and control systems, unless there is a considerable upgrade in its capabilities, it will still provide little serious opposition to Israeli air supremacy. The future of relations between Syria and Israel - its main, but not exclusive, potential enemy - are very uncertain, to say the least. Syria remains committed to the full return of the Golan heights, which largely precludes a final settlement between the two states for the foreseeable future. The likelihood of an Israeli-Syrian war erupting is also uncertain. The Al-Aqsa Intifada, the coming to power of General Sharon, and the subsequent hardening of Israeli policy towards the Arabs have all led to a marked increase in tension between Israel and Syria. Indeed, Israel's recent air strikes on Syrian positions in the Beqaa valley have brought the two closer to war than they have been in over a decade. It is not inconceivable that renewed Hezbollah attacks on Israeli forces could lead to large scale (rather than merely symbolic) retaliatory Israeli air strikes against the Syrian military infrastructure in Lebanon. Syria would be left with little alternative but to defend its forces in Lebanon as best it can and "rattle the saber" along the Golan Heights. Strike and counter-strike could be followed by limited Syrian commando assaults on targets such as Mount Hermon and an Israeli ground incursion into Lebanon. At present, the outcome of a full-fledged Syrian-Israeli war is certain. Syria is not a viable threat to Israel, even in the unlikely event that Iraq or even Egypt join the fray. These combined Arab armed forces would be unable to launch a successful conventional assault on the Jewish state. That said, the political objectives of war do not always necessitate military victory. The outbreak of war in the Golan Heights would generate intense international pressure for a cease-fire, and in the ensuing post-war diplomatic environment Syria may achieve gains. The most relevant question is not whether Syria can win such a war militarily, but whether the Syrian regime can survive the war politically. Israeli air and armored units are capable of quickly and decisively decimating "politically relevant" units of the Syrian military. It is doubtful that the young Syrian president would be able to maintain authority over a disgruntled military that, in all likelihood, will place blame for the fiasco squarely on his shoulders. Syria's Intelligence Services: A Primer, Middle East Intelligence Bulletin, July 2000. Syria's Praetorian Guards: A Primer, Middle East Intelligence Bulletin, August 2000.